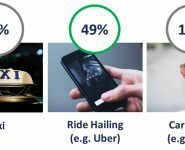 At best, says ACA Research, a business might have a database of the vehicles that have been serviced, but that is unlikely to be reflective of the local market. The team at ACA Research says that in their experience, anecdotal evidence based on conversations with other mechanics and good old gut feel are the other “trusted sources” a mechanic might use. Robust, verifiable, comprehensive and independent data about the make-up of the car parc at a local level has always been a major information gap for aftermarket businesses. Simple questions such as “What are the top vehicle models in my local area?” and “When were these vehicle models registered?” have remained unanswered. Why does this data matter? ACA Research says that empowered by this data, a business would be able to compare the profile of vehicles it services against the profile of vehicles owned in the local car parc to see if there are any gaps, and unmissed servicing opportunities; make investment decisions around training and tools to service either popular or niche models; and create local marketing campaigns aimed at owners of specific vehicle models to attract new customers. 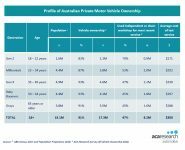 The main data source on the Australian Car Parc is the ABS Motor Vehicle Census. Unfortunately, this only presents aggregated data at a national level, with some state level splits. The good news is that local level data is available via a subscription service from the ABS offering data down to much more granular units of geographical analysis. 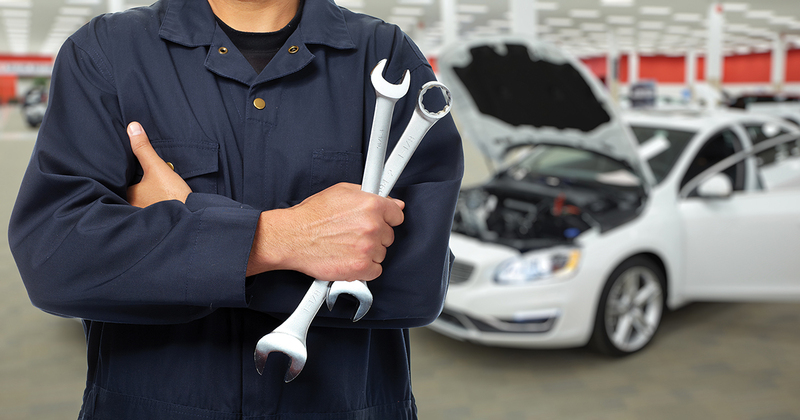 However, ACA Research cautions an average mechanic is unlikely to have the analytic skills, available time, or budget to invest in this subscription. Working with the AAAA, ACA Research has been investigating how to take this data and present it in a user-friendly format which will provide independent workshops with access to local level car parc data. This is still a work in progress, but ACA Research says it is taking this opportunity to provide a taster of this new data service that will become available to AAAA members in the future. Take the hypothetical example of a mechanical and tyre service business in Adelaide Hills. 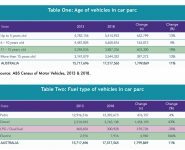 The ABS Vehicle Census says there are just over a million passenger vehicles in South Australia and over 200,000 light commercial vehicles (LCVs). The LCV category has grown 17 percent in the last five years, whereas passenger vehicles have grown seven percent. The average age of a SA motor vehicle is 11.4 years old, higher than most states. Around a quarter of all vehicles in SA were manufactured in the last five years. 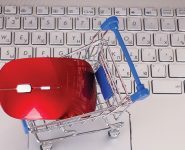 This is useful contextual data but it does not help your typical Adelaide Hills business determine whether they should specialise in any particular make, model or marque of vehicle, says ACA Research, stating it would make perfect sense for a business to position itself as capable of servicing all makes and models. This is how workshops in Adelaide Hills are positioned in the market as indicated in the extract (Table 1) from one company’s website. Now let’s take a more granular look at the Adelaide Hills LGA car parc, using the visualisation tool ACA Research is building based on the ABS data. 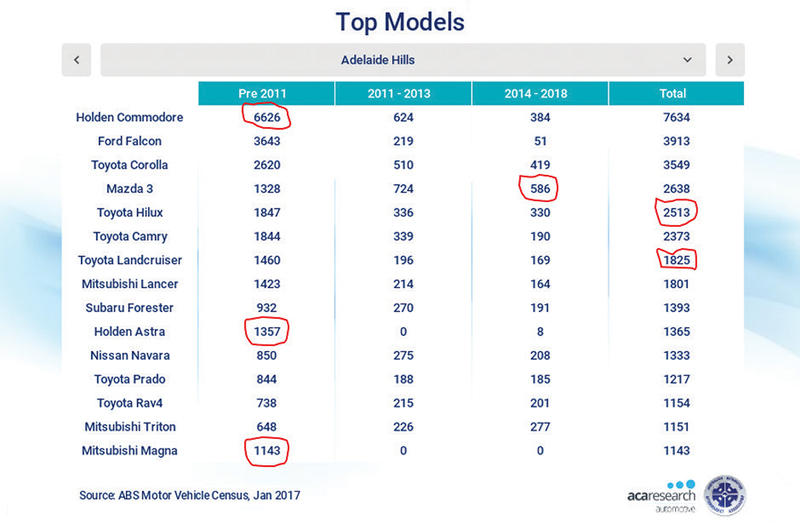 The screenshot (Table 2) shows the top vehicle models in the Adelaide Hills LGA broken down by year of manufacture. This shows that a pre-2011 Holden Commodore is the most popular vehicle registered in the area. Looking at newer vehicles, the Mazda 3 is the most popular. The Landcruiser is the most popular 4×4 and the Hilux is the most popular ute. Looking at the bottom of the list, we should not ignore the 1,143 pre-2011 Mitsubishi Magna’s and the 1,357 Holden Astras. Armed with more granular data, the owner of your Adelaide Hills workshop can now begin to address the following questions: Do I have the capabilities (trained mechanics and tools) to service all of these models? Are there are any models that are underrepresented in the portfolio of vehicles that we service? Should I specialise in servicing certain models, and market these specialisations to owners of these vehicles? This simple yet powerful diagnostic tool enables workshops to make an informed view of how their business is performing and where it needs to invest in order to grow the business. ACA Research is working with the AAAA to develop this tool further and to roll it out to members in the not too distant future.